B's NewsFlash! - B's announce new Mass Lottery game?! Yeah these are great and all but is there any chance we can scratch off a 5 or 6 game win streak from any of these...? Mass State Lottery and B's Team Up for Instant Ticket - Game will raise millions for taxpayers; award season tickets for a decade. BOSTON, MA - The Massachusetts State Lottery and the Boston Bruins have teamed up to create an exciting new instant game that will raise millions for Bay State communities while entertaining and exciting fans with incredible prizes, including Season Tickets for a Decade. Treasurer Timothy P. Cahill and Boston Bruins Owner Jeremy Jacobs announced the partnership at a 3 p.m. press conference today at the The Sports Museum. The Boston Bruins instant game is expected to sell more than $50 million in tickets and raise more than $9.6 million for Massachusetts’ 351 cities and towns. "We believe the Boston Bruins game is the perfect icing on our instant-ticket cake," said Treasurer Cahill, chairman the Massachusetts State Lottery Commission. “Once again, a Boston sports franchise has stepped up to help raise revenue for police officers, fire fighters, teachers and other essential municipal services.”The Boston Bruins instant game features never-before available prizes for New England hockey fans such as 300 Suite Experiences and 90 Bench Experiences during home games. 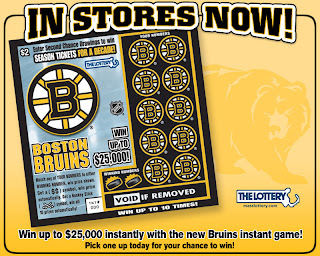 The $2 game, which goes on sale tomorrow at 7,500 Lottery agents, also features authentic Bruins gear and collectibles. "We are certainly pleased to be partnering with the Commonwealth of Massachusetts on this instant ticket which is set to generate $9.6 million for Massachusetts's cities and towns," said Jeremy Jacobs, Boston Bruins owner, Chairman and CEO, Delaware North Companies and Chairman of the NHL Board of Governors. “I would like to personally thank Treasurer Cahill for his diligence and foresight in bringing this partnership to life. "Lottery players will win more than $32 million in cash prizes over the life of the game, including 25 top prizes of $25,000. One lucky player will take home the incredible grand prize of Boston Bruins Season tickets for a decade. “The unique prizes available in this game will create enormous excitement among our players and Bruins fans," Lottery Executive Director Mark Cavanagh said. "We’re confident the Boston Bruins game will quickly become a favorite among our customers. "Since creating the sports-themed Lottery game market in 2006, the Massachusetts State Lottery has sold $838 million in sports-themed tickets and raised $115 million for Massachusetts cities and towns. The Lottery expects to surpass the $1 billion mark in sports-themed ticket sales later this fiscal year. So, heard any interesting Bruins news lately? Thank God they hand out programs before the games now, we'll need one tonight! No Lucic or Savard for the next four to six weeks. Kobasew is now deep in the woods of Minnesota. So that means the B's take the ice tonight with the likes of Paille, Sobotka, Marchand and Whitfield in the lineup. Oh joy! While I am looking forward to seeing what the kids can do, I was really hoping it wouldn't be under such dire circumstances. So, with all this craziness going around, is it time to hit the panic button? Yes. And no. Obviously losing two key players like Savvy and Lucic is never a good thing. Any team that loses it's leading scorer is never better than when he's in the lineup. Ditto for losing your most fearsome physical presence. In the very short term, the B's may be able to overcome the loss of Savard easier than the loss of Lucic. Only reason I say that is because of the games the B's have coming up. Nashville tonight, and especially Philly tomorrow (In Philadelphia). Nashville frankly isn't a very good team. So their whole plan will be to attack attack attack. Play with an edge and try to outwork teams. No Looch on the ice limits Boston's ability to counter that. And Philly is one of the biggest, most physical teams in the league. They're off to a slow start, so they will look to bang their way out if it. Sobotka, Marchand and to a lesser extent are all game, but may not have the size to stand up to it. The longer term cause for panic is clearly the loss of Savard. He's been the Bruins leading scorer the last three years, and was once again leading the pack. If he's out on the longer side of his estimated recovery, the B's could struggle mightily to score enough. We'll see what the new guys can chip in, but the bulk of that burden will fall on Krecji (who has yet to get untracked) and Bergeron. But here is where I see a slight glimmer of hope among this doom and gloom. The Bruins biggest problem so far has been effort and lack of commitment. When slapped in the face by reality the way they have been (starting off with Chiarelli's trading of Kobasew, which was clearly meant as a wake up call), to losing two key forwards, sometimes teams rally around each other in that situation. At least in the short term, perhaps they can find within themselves that something extra. They may just be able to play above their heads a little, and hang in the race in the East long enough for the walking wounded to get healthy. Remember, finishing first overall isn't the goal. Just make the playoffs, and be healthy and playing well going into the tournament. Again, are the Bruins a better team than they were a few days ago? Hardly. But we're about to see what kind of character these guys have. If it's of a high enough quality, they may just be able to use this as a good thing. A rallying point that could turn their season around, as hard as that is to believe. And who knows? Maybe having a rested Lucic and Savard back in the line sometime in late November or December could pay off in the spring. So there you have it, my best attempt at keeping the lid on the old panic button. Check back in a week or two, and I could have a totally different perspective. What about tonight? Nashville comes in loser of their last five (one in OT) after winning their first two. Jason Arnott is out of the lineup,seriously limiting their offense....which has only scored a grand total of ten goals to begin with. In my mind, even with Boston in the condition it is, they should be able to play good enough D to scratch out a win tonight...possibly a lopsided win if the kids enthusiasm rubs off on the team as a whole. Amazingly, the Preds have had only one fighting major this season, and it wasn't Jordin Tootoo. But with both teams desperately needing some positive mojo, I fully expect to see the gloves come off at least once. On the Nashville side, look for Tootoo to be the aggressor. He always is. Love him or hate him, you always get max effort from that guy. Sometimes he crosses the line, in which case someone will have to answer. He can not be allowed to run around and dictate pace to the Bruins. Settle him down early, and he WILL take a dumb retaliatory penalty at some point. Wade Belak is another guy that has been know to mix it up a bit. A veteran like him could see the opportunity of a hobbled Bruins team as just the right time to provide his mates a spark. And just for fun, maybe somebody will whack former Canadien Francis Boullion around just for old time's sake. The question is, with Lucic out, and Thornton apparently ailing (missing the last two days of practice), who handles the rough stuff for the B's? Mark Stuart would be my guy to watch. Stuart is quietly establishing himself as a very solid veteran back there. I think he's one guy that will pick up the torch and move this thing forward. He's a young guy, but I see "quiet leader" in him, big time. He could be the one to dole out Tootoo's beating (if it's even possible to "win" against that guy.). and in the wishful thinking column, Chara had better make his presence felt out there. Doesn't have to be a fight....although I won't complain. But he HAS to start throwing people around and being the bully out there. 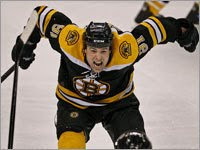 Intimidation goes a long way in the NHL, and there is no more intimidating force in the league than a ticked off Chara. I intentionally held off on posting my score prediction until the end today. As always, score predictions are always just what I "feel" at that moment. And while I've been typing, I've talked myself into a big B's win. I say, 5-1 Bruins. Sobotka, Chara, Bergeron, PAILLE and Wheeler all score for the good guys. Step away from the panic button all,at least for a few days. Yesterday, obviously fed up with the lackluster play of his team, Bruins general manager Peter Chiarelli pulled the trigger on a trade. Sending sometimes fan favorite, sometimes whipping boy, Chuck Kobasew to Minnesota where he will join another favorite former Bruin, Shane Hnidy (I suspect a certain die hard Bruin fan I know may start keeping tabs on the Wild because of those two. Yes A.H., I'm looking at you). For whatever reason, many Bruins fans were "down" of Kobasew since he arrived in Boston. I'm sorry, but I just don't get it. He was always a very hard working guy. He was very physical, playing much larger than his diminutive frame would suggest. And he was a consistent 20 goal scorer. Not sure what people expected of him, but I will miss him. All that being said, I think this may have been a good trade by Chiarelli. As much as I hate to see Chucky gone, the deal makes a lot of sense. In the short term, a move like this is sure to get the rest of the rosters attention. Chilly has sent a clear message that the effort hasn't been good enough, and he isn't going to sit back and hope they start playing better. Also, this allows the B's to bring up a couple kids in Sobotka and Marchand (Lucic being placed on Long term IR frees up an additional spot for at least ten games). With that window of opportunity, these two can have a legitimate chance to prove they belong in the NHL and can fill the role Kobasew filled (and then some? ), with a smaller cap hit. For all of the Sobotka apologists who feel that he was getting screwed by the B's, here is his chance. (Why everyone feels like he "deserved" to be on the roster out of camp the last couple years, is a whole other story which I won't get into now). Sobotka should finally get a chance to play with top six forwards, as opposed to the fourth line role for which he was ill suited. Marchand will also get a chance to play on the third line, which could use his feistiness and occasional goal scoring pop. If the Bruins players need any explanation for what management sees wrong with their play, all they have to do is look at the players they called up. Sobotka, Marchand and Lefevbre all are "nasty" to one degree or another. We all have memories of Sobotka throwing his (tiny) body around and being a thorn in Montreal's side during the playoffs two years ago. Marchand comes advertised as a classic "agitator". And Lefevbre is always looking for a dance partner out there and will throw his body around at will. If there is one common theme in what ails the Bruins, it's that they haven't been NEARLY as physical or "hard to play against" as they were last year. The word from the top is, THIS ENDS NOW. Or more changes will come, be sure of it. But this move also is largely about the long term. Kobasew was due to make $2.3M this year and next. Freeing up that cap space can do a few different things for the B's. first, they can use some of those draft picks they're stock piling to pick up an impact player, either at the trade deadline (when you'd only be assuming a pro-rated portion of his cap hit), or sooner if the call ups don't pan out as planned. That is sort of the "near long-term" I guess. Longer term, Chiarelli has several key free agents to think about next year. Does he want to bring Savard back? I would think so. I also think Savvy wants to come back, and *may* take a slight discount to stay here. But the B's Cap situation isn't good, so clearing some space is vital. They also have Blake Wheeler among others to tie up. So, it's never too early to start planning. The other rumor I've been hearing is, Chilly is clearing space to make a bigger splash. Did someone say Ilya Kovulchuk? While the thought of him reuniting with Savard is enough to make any goal starved B's fan salivate, I'm not sure it could happen. Kovulchuk makes $7.5 this year, and is a UFA as of July 1st. Only way I could see Chilly going after him is if he could get him signed long term. And frankly, I don't know that they can afford to do that. beyond that, word is he's content in Atlanta and may want to return there, as long as they keep playing well and going in the right direction. Adding even more wrenches in the Bruins gears (of they are after him), the Russian League (KHL) is supposedly ready to offer an enormous deal to the big winger should he not resign with the Thrashers. The bottom line is, Chilly has sent a very loud, very clear message to his troops. he and Julien have a clear game plan for how the team needs to play. And if the current players aren't up to that committment, he'll find guys who are. We all know the B's window for doing big things in the post-season is closing rapidly. Chilly, I think, is showing the proper level of urgency. Let's just hope his troops get to that level ASAP. I am on the record as saying I thought this team would struggle out of the gate this year. I also said I wasn't convinced they were any kind of lock to make the Cup Finals. Well, the losses of guys like Axelsson, Yelle, Ward and nidy are really starting to show up in my opinion. The Penalty Kill thus far has been an absolute joke. Axe and Yelle were both great penalty killers. And teh D has been "scrambly" all season. Lots of running around, seemingly totally disorganized. Ward and Hnidy were the poster boys for calm back there. The loss of Ward especially to me is a huge loss. He was not only steady on the back end, he was also a leader in the locker room. At this point, I wonder who, if anyone, is actually "leading" this team. Sooner or later a player or two has to step up and say enough is enough, then do something about it. I would hope that guy would be Chara, but he has been nearly invisible thus far. He isn't playing terribly, but he also isn't making much of an impact on the game. Again, not good enough. Goaltending? Please....don't even get me started on the goalie play. While the team clearly has been playing poorly in front of them, neither has seized the moment and won them a game. Thomas in particular just looks "off". Don't get me wrong, I'm not baling anyone in particular, and I'm not giving up on him. I have faith that he'll be fine (although, as I said in the preseason, not back to Vezina form). The Bruins have a lot of questions that need to be answered. Chiarelli just posed another one to his team. Do you REALLY want to be a great team? Time for the boys to answer on the ice. I'm sick of hearing the lip service in every interview. Put up, and shut up. The Bruins finally play their first road game of the season tonight in Dallas. Is this the perfect confluence of events for the struggling Black & Gold? I think we can all agree that perhaps getting out of town for a few days is a good thing for the team. They get to get away from the pressure and high expectations of the locals for a bit. The road sometimes has a way of simplifying team's games and curing some of the ills that plague them on home ice. I certainly think time away from the Garden could be a boon to their morale. Before I go on, I feel the need to explain (yet again) how big of a fan of this guy I have been for a LONG time. I started hoping and praying he would one day be a Bruin by the time he was 15 or 16 years old. Nobody wants to see this kid succeed more than me. But thus far this season I have been supremely disappointed. 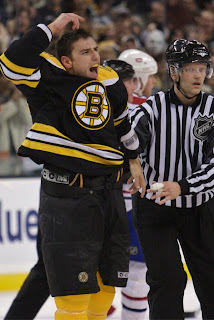 Yes folks, this is Milan Lucic I'm talking about. The good news is, I still believe that Milan cares enough to do what it takes to right his ship, which will go a long way towards fixing much of what is wrong with the Bruins thus far. Lucic needs to play with emotion, effort and sheer force of will to be a productive NHL player. Thus far, he has shown none of that, barring one lopsided beat down of Jay Harrison of the Hurricanes (which just happens to be the only game in which the Bruins looked even slightly interested in playing hockey....coincidence?). The performance Lucic put on in the last game was simply embarrassing. He was invisible on the ice, except for glaringly failing to even provide a token back-check on Colorado's second goal. He has zero goals and three assists. Which honestly, I can live with at this point of the season. The stat that is unacceptable to me is shots. Playing on the top line with one of the best set-up men in the league in Marc Savard, Lucic has managed to land a whopping four shots on net. For comparison, fourth line winger Shawn Thornton has cranked off eleven shots on net. Thornton, by the way, plays roughly six fewer minutes per game than Lucic. And has Steve Begin as his Center, not Savard (even Begin has 8 shots, doubling Lucic's output. I know, I know...shots on goal don't tell the whole story. I get it. But sometimes it is in fact a very good indicator of one thing. Effort. Thornton and begin get shots because they WORK for them. They go to the net hard. They pay a price. Thus far Lucic, he of the 6'4, 220lb frame has been content to exist on the margins. Playing an outside, away from the net game ill suited to his skill set. Our big, bad "Loochamotive" as Kevin Paul Dupont likes to call him has so far existed strictly on the spur line, yet to find his way to the main track to the ultimate destination. I'm sure his many protectors on the internet will respond by pointing out that he leads the team in hits. Fair enough. Through five games he does lead with 14 hits (Begin is second with 11). But lets be honest. How many of those do you remember? I don't expect him to run people through the glass every night. What I do expect though, are the type of hits that separate a defenseman from the puck (if not his wits) once in awhile. And while we're on the honesty kick here, keep in mind he's so far been the beneficiary of home cooking. Hits are such an arbitrary stat, that they are almost meaningless. Especially when you consider the home player nearly always gets the benefit of the doubt. Any body contact at all, is called a "hit" for the home team, and never mentioned for the visitor. But, it isn't all doom and gloom on the Lucic front (I refuse to call him "Looch" until he starts playing like "Looch" again). As much as I disapproved of his antics at the final whistle Saturday, at least he showed SOME emotion. Maybe, just maybe, he's decided he's had enough of this kinder gentler version of himself. Maybe the luster of that shiny new multi-million dollar deal has worn off. I think it has, and I expect to see the old Lucic we all knew and loved return with a vengeance. If that happens, trust me, the rest of the team will respond in kind. He may still be a kid, but he is a natural leader. His actions invariably promote a response. If he's going hard, so does the team. If he takes the night off, well, the boys play along. Thornton can't be the only guy to constantly try motivating the team with big hit or a fight (after a few of those "let's get going" bouts, it comes off as fake, and loses it's rallying cry effectiveness). So what do I expect of the weekend? First and foremost, Lucic is back. Beyond that, I think we'll see the rest of the team playing a much better brand of hockey. Julien has had a few days to get some solid teaching done, and he's shown in the past that he uses that time very well. He broke out the whip early on, but has since backed off a bit opting to teach, not punish. He is the master at mixing those two styles. Boston wins tonight, 4-1. Although Dallas is fresh off a 6-0 stomping of Nashville, they aren't a dominant team. Lucic, Chara, Ryder and Begin score. With the agitator Ott on the shelf, there is no natural "enemy" for the Bruins to target. But Kris Barch (who last year had to try to clean up Ott's mess) is still around, and is the most likely candidate to drop the gloves. Look for he and Thornton to renew acquaintances as some point. But as hard as I expect Lucic to go tonight, the thought of him picking up a fighting major isn't out of the question. But who could his partner be? In an absolute REACH, I'm calling for the big defenseman Mark Fistric to pick up his first fighting major in the NHL. At 6'3, 228lbs he has the size. Not sure it ends well for Mr. Fistric, but hey...if you have "FIST" in your name and your that big, eventually you HAVE to fight don't you? So there you have it. Sorry for the Lucic rant. Trust me, it pains me to write it. And I know he isn't the whole story when it comes to the B's shaky start. But he just may be the whole story in turning things around....or at least a very good starting point. B's NewsFlash! - Looch reup's with B's for 3 More Years! Milan Lucic, the Bruins' popular and bruising third-year forward, has agreed to a three-year extension with the club through the 2012-13 season, according to the team. According to TSN, the deal is worth $12.25 million, giving Lucic a $4,083,333 annual cap hit. Lucic will still be a restricted free agent at the end of the contract. "I'm not surprised," said one agent. "I thought it would be between $4 and $4.5. He brings intangibles far beyond his numbers." Lucic and Chiarelli will hold a press conference to discuss the deal immediately following the team’s 10:30 a.m. practice at Ristuccia Arena in Wilmington tomorrow. The 21-year-old Lucic set career highs in all major statistical categories last season, scoring 17 goals and adding 25 assists for 42 points. An aggressive checker and an outstanding fighter, he also tallied 136 penalty minutes and finished with a +17 rating. Last Saturday, Lucic bloodied Carolina's Jay Harrison in a second-period bout. In the preseason, Lucic opened up Ottawa tough guy Chris Neil. During the 2008-09 postseason, the 6-foot-3-inch, 228-pound winger had three goals and six assists and a team best +12 plus/minus rating in 10 games. In his rookie year in 2007-08, Lucic registered 8-19=27 totals and 89 penalty minutes in 77 contests. Lucic earned the team’s “Seventh Player Award” for his efforts, an award voted on by the fans and given to the Bruin who performs above and beyond expectations. He alsocontributed two goals in seven postseason games. Lucic has skated in both games during the 2009-10 season and has one assist and five penalty minutes. He was originally drafted by the Bruins in the second round (50th overall) of the 2006 NHL Entry Draft. One more quick look back with Respect & Admiration to The King! I'm leaving last night's Bruins preseason er' regular season opener for Kynch or Frank N to comment on. Because for me I'd rather take this chance on the KBBK to send my truly heartfelt thanks, congratulations and much respect to one of all time favorite athletes, the One & Only True King! #19, Burnaby Joe Sakic! And so it begins. With a chill in the air, and optimism on the rise, the Bruins get back to work tonight at The Garden. And this year's opener is no cake-walk. Facing the explosive Capitals right out the gate can be a daunting task. Not sure I'd want to try handling a fresh, excited Ovechkin right away. But that is the task at hand. I think the boys are up to it. I love the balance of all four lines. Any one of them can score, and the fourth line has the potential to cause havoc every shift. Yikes. I'm pretty sure I like the top pairing just fine......partly because, I'm pretty sure even I wouldn't look totally out of place playing with Big Z. The second pairing scares daylights out of me. That has Keystone Cops written all over it. They'll be fine in the offensive end (unless Wideman decides to go on one of famous skates through the countryside and/or insist on using his big slap shot, which he has yet to hit the net with). But in their own zone, I don't like them at all together. Especially against a big, physical and highly skilled team like the Caps. This could get ugly for those two, quick. I actually think I might prefer the third pairing over the Wideman/Ference duo. Stuart as established himself as a fairly reliable stay-at-home defender, while adding a bit of offense to his game as he's gone along. Hunwick, while he didn't have a great camp, has tremendous offensive upside and can skate with anyone. Defensively, he has some work to do, but isn't awful by any means. All in all, a more than serviceable #6 defenseman. When looking at the Caps roster, it's pretty obvious where it all starts. Alex Ovechkin, love him or hate him, is the most dynamic player in the NHL today. His mix of speed, skill, size and fearlessness puts him on another level. We all know he has a booming shot, and soft hands. He also has a serious nasty streak, and goes out of his way to initiate contact. But he's not alone. Washington is loaded with, big, talented players. Newly acquired Mike Knuble (a long time favorite in these parts) should be a big boost to their net-front presence. The Caps, for all their size, have never been great at going to the net. The veteran Knuble will fill that void nicely (although they do it differently, Recchi will fill the same role for Boston). 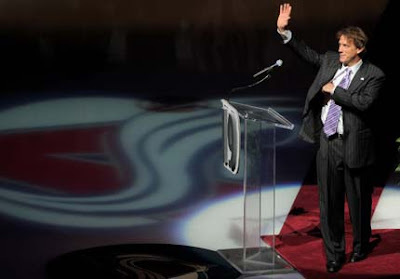 Add in talented youngsters like Backstrom and Semin, and you have lots of star power. Old friend Michael Nylander has lost a bot of his magic, but can still be a lethal play maker. On D, former B's prospect Shaone Morrison and offensive specialist Mike Green anchor the Caps back end. One of my personal favorites, Milan Lucic may not play tonight, as I've heard rumors of him being scratched. Don't know why he wouldn't dress, but he's turned himself into a decent, stay at home defender. Perhaps the Caps want more speed on their back end to match up with Boston? For Boston it really is simple. Keep Ovechkin in check. Basically what that means is, don't let him dominate the game. He may score, he usually does, but if you hold him to one goal as opposed to a hat trick, you have a shot. Boston will have to match Washington's skill level, while at the same time winning the physical battles. As big as OV and his mates are, several of them (especially OV) tend to get very distracted by constant punishment. Lay it on early and often, and you get them out of their game. So, here's hoping we get off to a busy start with the fisticuffs! I say Boston wins, 3-2. Thomas is called on to make some spectacular saves, and he delivers. Wheeler, Bergeron and Chara are your scorers. Thornton and Erskine drop the gloves in a decent bout. OV gets booed for carrying on after a brutal Chara hit.